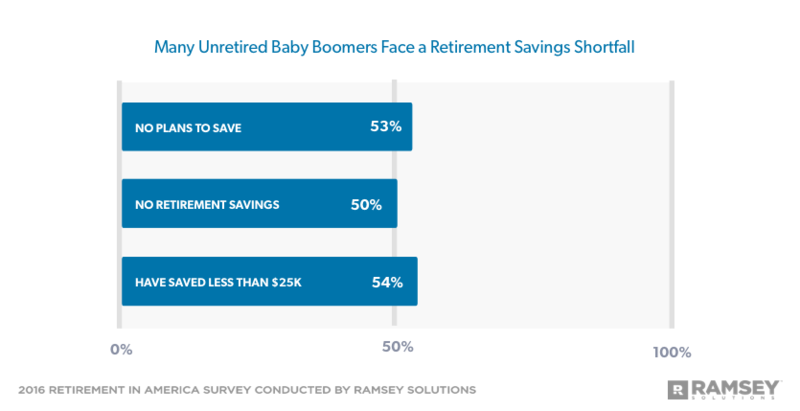 53% of working Baby Boomers who aren't currently saving for retirement have no plans to save. Just 9% of middle-income workers save 15% or more of their income for retirement. Men are nearly twice as likely as women to have saved $250,000 for retirement. While not exactly split down the middle, Americans do fall into two nearly equal groups when it comes to retirement saving. Savers make up the slight majority at 58% of Americans, leaving 42% who are not currently saving for the future. But the differences between savers and non-savers go much deeper than that. Age, income, gender and marital status all have an effect on who saves and how much. Results from a 2016 survey of more than 1,000 U.S. adults also show that even among savers, few are setting aside enough to afford a truly secure retirement. In fact, only one in 10 Americans save 15% or more of their income—the amount industry experts recommend individuals set aside in order to build adequate savings—for retirement. 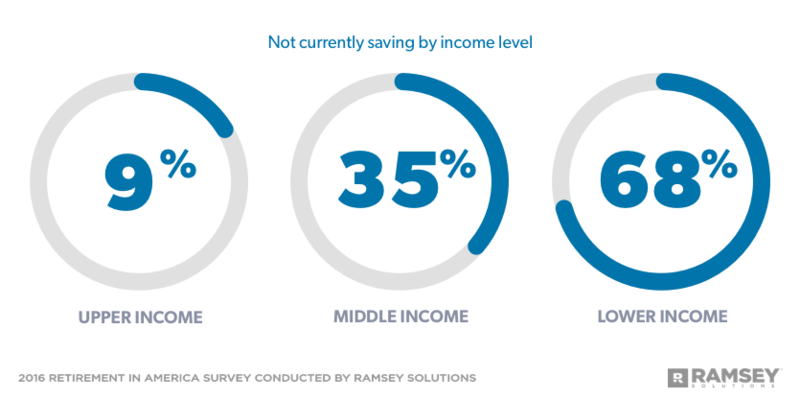 The final report in a four-part series based on the survey commissioned by Ramsey Solutions focuses on who is saving, how much they’re saving, and how their retirement dreams match up to reality. Around six in 10 of both Millennials and Generation Xers are currently saving for retirement. However, only 13% of Millennials and 16% of Gen Xers are saving 15% or more of their income for retirement. 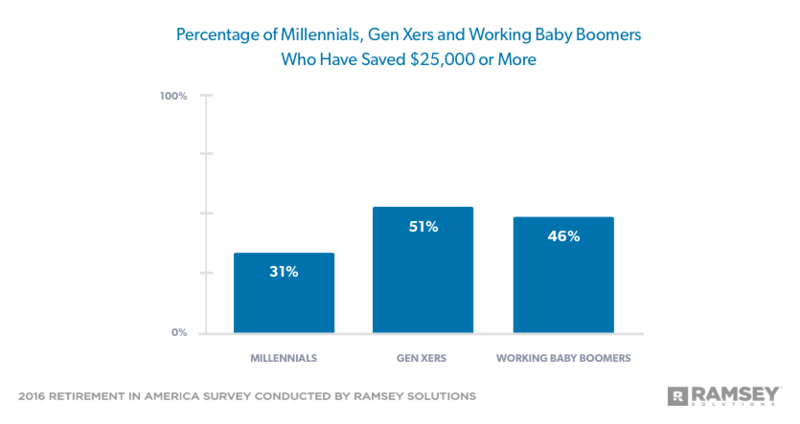 Most of those who are saving, 43% of Millennials and 39% of Gen Xers, are saving 1-9%. Of the Millennials who have money set aside for retirement, 42% have saved less than $25,000, and half of Gen Xers with savings have $25,000 or more. But 28% of Millennials and 20% of Gen Xers have no retirement savings at all. "While it's promising to see people saving for retirement, it's important they increase the amount they're saving in order to do things like travel, spend time with family, or open a business in retirement," Chris Hogan, financial expert and number one, national best-selling author of Retire Inspired, said. "Once you're out of debt and have a fully funded emergency fund, you should be investing 15% of your income so you're able to reach these goals," explained Hogan. Many Baby Boomers are already facing a shortfall: 54% of Baby Boomers still in the workforce have less than $25,000 saved for retirement. Of that group, more than half have no retirement savings at all. And even though they are within a few years of traditional retirement age, only 57% of Baby Boomers who are still working are trying to build up their retirement funds. 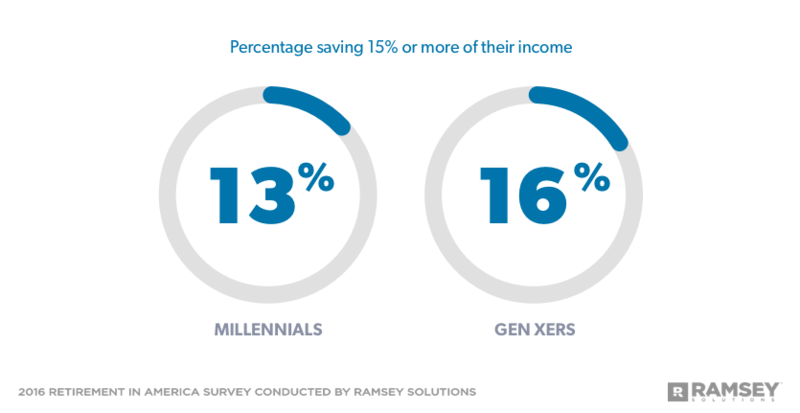 Just 16% are saving 15% or more of their income for retirement. Approximately three in 10 are putting away less than 10%. Even more alarming, more than half of working Baby Boomers who are not currently building up their retirement funds report having no plans to save for retirement in the future. Nine in 10 upper-income earners are currently saving for retirement, with nearly 30% setting aside 15% or more of their income. As a result, more than six in 10 upper-income workers have saved at least $50,000 for retirement, while only 6% have nothing saved. Almost two-thirds of middle-income earners are currently saving for retirement, but only 9% save 15% or more of their income. Just 22% have saved at least $50,000 for retirement, and 27% have empty nest eggs. There's no denying that setting aside money for retirement can be easier on a larger income. But with careful planning and budgeting, people at any income level can save for a comfortable retirement. It won’t always be easy, but saving money now is a lot easier than facing retirement with no money. Less than one-third of lower-income earners currently save for retirement, and just 4% save 15% or more of their income for retirement. Only 6% have saved at least $50,000 for retirement, while 64% have nothing saved at all. Almost four in 10 lower-income earners do not plan to save for retirement in the future. "There’s no denying that setting aside money for retirement can be easier on a larger income," Hogan said. "But with careful planning and budgeting, people at any income level can save for a comfortable retirement. "It won’t always be easy, but saving money now is a lot easier than facing retirement with no money," he added. Men are more likely to save for retirement, and they save at a higher rate than women. More than three-quarters of men are currently saving for retirement compared to 60% of women. And, while 37% of women save 1-9% of their income, 36% of men save 10% or more of their income. More than one-third of women have zero retirement savings, while only 15% of men say the same. Approximately one-third of women have saved more than $25,000 compared to 51% of men. Men are also nearly twice as likely as women to have saved $250,000. Fewer single people save for retirement than married couples—49% compared to 65%. About one-third of singles currently set aside 1-9% of their income for retirement, while the same number of married couples save 10% or more. More than half of married couples have saved at least $25,000, while 30% of single people have saved as much. Just 18% of married couples have no retirement savings, while one-third of single people have not saved anything for retirement. "Saving as a single person has its challenges and its benefits," Hogan said. "Even though you're covering all your living expenses on one income, you call the shots. An accountability partner—a relative or friend who's good with money—can help keep you on track with your savings goals." Of those who are currently saving for retirement, seven in 10 wish they were saving more, and often, the obstacles preventing them from saving more are the same regardless of age, income, gender or marital status. Cost of living was the top reason why people don't save more for retirement in all demographic groups. Kids' activities/needs ranked second or third for Millennials, Gen Xers, all income levels, married and single people, and parents. Medical expenses are a top financial hurdle for Baby Boomers (24%), while credit card debt is a problem for men (25%) and those who don't have children (21%). Fewer debt-free savers identified any obstacles to retirement saving than savers who are in debt. Only 19% of debt-free savers said their top hurdle was their kids' activities/needs—the most common choice. The next most common choice was vacations/going out to dinner/impulse buying, with only 17% of debt-free savers identifying this as an obstacle to retirement saving. On the other hand, almost one-third of savers who are in debt ranked credit card debt (31%) and their primary mortgage (31%) as the top reasons they don't save more for retirement. Medical expenses ranked third (27%). "The good news here is that if people focus their energy—and their money—on getting rid of debt, they'll eliminate the barriers that are keeping them from their retirement savings goals," Hogan said. Of those who are not currently saving for retirement, 62% say they plan to save in the future. While the cost of living also ranked as the number one reason non-savers aren't saving now, lack of planning is an issue as well. It ranked as the second or third reason across all demographic groups. "I understand that cost of living can take its toll on your monthly expenses, but saving for retirement has to be a priority if you want to retire with dignity," said Hogan. "Make a monthly plan for your money and cut unnecessary expenses that could be keeping you from reaching your savings goals. Small sacrifices now can really pay off in the long run." Other reasons people aren't saving for retirement: medical expenses for Baby Boomers (33%) and lower-income earners (29%); credit card debt for middle-income earners (27%), men (29%) and married couples (28%). Despite their lack of personal retirement savings, non-savers' vision of their golden years is the same as that of savers. Both groups want to spend their retirement with their family and traveling for pleasure. How will they pay for these leisure activities? Non-savers plan to rely mostly on Social Security combined with their personal savings/cash and income from continued work. Savers say their retirement income will come from their 401(k)s and personal savings/cash, then Social Security. Oddly, non-savers are actually slightly less worried than savers about running out of money in retirement. Only 44% of non-savers say they worry that they will outlive their money in retirement compared to 46% of savers, even though 88% of current non-savers have less than $25,000 earmarked for retirement. "Planning to rely on Social Security alone is a big mistake," said Hogan. "Most people only get an average of $1,340 per month for Social Security, which is only a little more than $16,000 per year! You won't be doing much traveling on that income alone. "Instead, determine what you want your retirement to look like, and match your monthly retirement savings to that dream," said Hogan. "Social Security should be the icing on the cake, not the cake itself." The retirement savings crisis is no longer on the horizon—it's already here. According to Pew Research, 10,000 Baby Boomers reach age 65, traditional retirement age, every day. But nearly half of them, 49%, will face their golden years with less than $10,000 saved. However, it is possible for younger generations to turn the tide. Gen Xers already have the most savings of any generation, while Millennials are already establishing good retirement saving habits. If they make the most of the time they have by increasing their saving rates and establishing a solid retirement saving strategy, the comfortable retirement they have envisioned for themselves can become a reality. Ramsey Solutions is committed to helping people take control of their money, build wealth, grow their leadership skills and enhance their lives through personal development. The company's success is defined by the number of people whose lives are changed by its message of hope. Through a variety of mediums, including live events, a corporate financial wellness program, publishing, syndicated columns, and two nationally syndicated radio shows, Ramsey Solutions uses commonsense education to empower people to win at life and money. Millions of people across the country have gone through Financial Peace University, and Ramsey Solutions' world-class speakers have brought vision, inspiration and encouragement to over a million more. Voted one of Nashville's Best Places to Work nine times, Ramsey Solutions employs more than 550 team members who are focused on and dedicated to doing work that matters. A popular and dynamic speaker on the topics of personal finance, retirement and leadership, Chris Hogan helps people across the country develop successful strategies to manage their money in both their personal lives and businesses. He is the host of the Retire Inspired Podcast, creator of the R:IQ assessment tool, and the author of Retire Inspired: It's Not an Age; It's a Financial Number, a #1 national best seller. For more than a decade, Chris has served at Ramsey Solutions as a trusted financial coach and Ramsey Personality. You can follow Chris on Twitter and Instagram at @ChrisHogan360 and online at chrishogan360.com or facebook.com/chrishogan360. Retirement in America is a research study conducted with 1,016 U.S. adults to gain an understanding on attitudes, behaviors and perceptions around the topic of retirement. The nationally representative sample was polled between February 26 and March 1, 2016, using a third-party research panel.